Scoble: "Tivo has completely changed my life." Back from NY at noon. I'm getting good at the cross-continental thing. Lucked out and got a window seat, with an empty seat next to me. This time the iPod ran out of juice over Nevada. I suspect it's because I let my dad use it to listen to If I Were A Rich Man in the hospital. I figured that was in the spirit of the iPod gift. Glad to be back. The weather is nice. Sunshine. High sixties. Relatively warm. Compared to NY. When I travel I like to read The NY Times and The Economist cover to cover. This time the most bizarre story was about North Korean leader Kim Jong Il. He's like a character out of Atlas Shrugged. While his people starve eating dirt and tree bark, he leads a train across Russia, flying in delicacies and prostitutes. He says African countries exaggerate their AIDS cases to help them get more money from from the west. I guess he should know. NY Times: "Jonathan Miller, the recently named chairman of the AOL division, will disclose the latest plans to turn around AOL in a four-hour briefing with investors in New York." News.Com preview of today's AOL presentation. 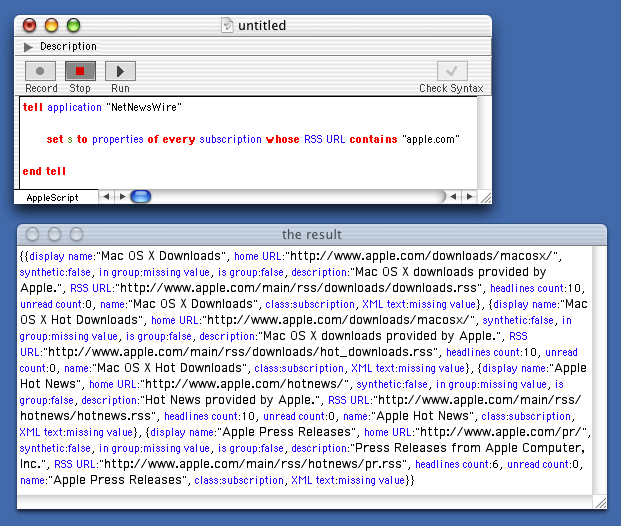 Brent Simmons shows how NetNewsWire will interface to AppleScript. Is this the kind of thing people using RSS feeds want? I'm curious. Personally, I've been using RSS feeds for over three years, and have only rarely wanted to do this kind of scripting, mostly to see how various forms of RSS are doing. And in those cases I'd go directly to the XML feeds, not use the database Radio's aggregator maintains. I wonder if there are any gold nuggets in there, killer apps for scripting and syndication. I suspect if they're there, Brent will find them. Reminder, the bootstrap of Blog Browsers continues. This was originally a Brent-Dave collaboration, but other people are now working on browsers, and other blogging tools are producing archives in a compatible format. Today's a travel day, returning to California from New York. I have an early morning flight that gets me into SFO roughly midday. Dad is doing better. Yesterday they turned down his respirator so he did roughly half his own breathing, so there was no time for writing or mouthing words, all his energy went into breathing. If you haven't been doing it on your own for weeks the muscles get weak, it's very hard work. Right now I wish I weren't leaving, but it's time to take care of my own business. Other family members are here and are coming and I'll be back soon. When I get back to California there will be many interesting things to do. December is always a fun month in Silicon Valley, and this year is shaping up no different. Seasons greetings and see you back in California. Last update: Tuesday, December 03, 2002 at 1:19 PM Eastern.